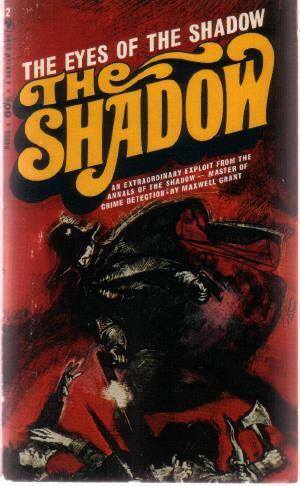 Walter B. Gibson's (as Maxwell Grant) “The Eyes of the Shadow”(1931) is the second of 'The Shadow' books and I guess my expectations were too high. It’s unnecessarily long for a pulp novel, there are too many characters, and Gibson’s tendency toward padding really made this one drag. 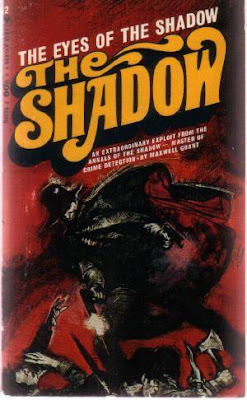 As with the earlier book, debut “The Living Shadow”, what we have is a routine old-timey mystery story which suddenly becomes dynamic and fascinating whenever the Shadow appears. It lurches back into tedium as soon as he’s gone, and his absences are frequent and lengthy. There are some interesting things here and there, though, including the first appearance of “Lamont Cranston,” laid up with a serious injury. One of the villains has an “ape-man” assistant whom I kept expecting would be revealed to be human, but he never was! The reader is left to wonder just what species this assistant belongs to. The action climax is pretty good, with the Shadow’s long-suffering agent Harry Vincent nearly stretched to death on a medieval torture rack. But it’s a long slog to get there, and Gibson’s stodgy prose is a liability. It’s not an awful book, but it’s probably not worth reading again.